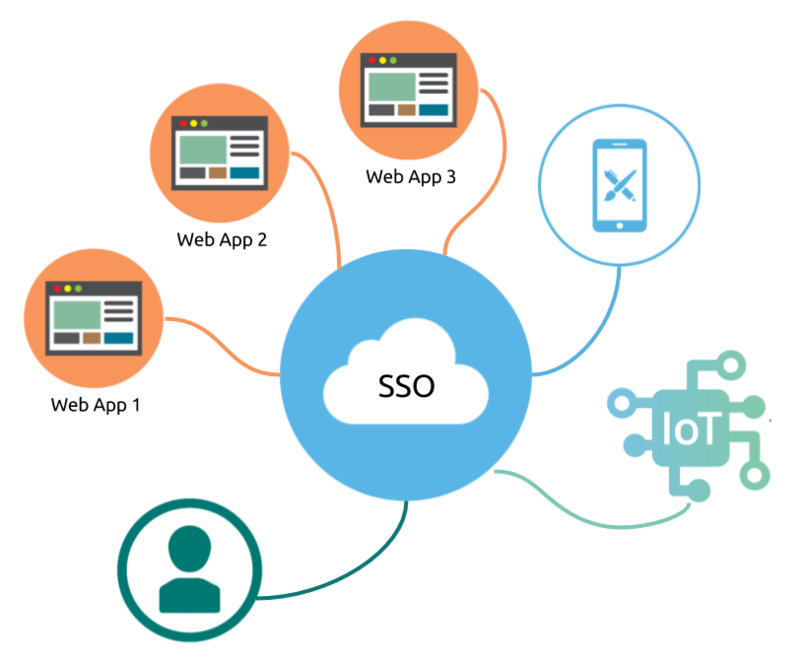 As the definition suggests, one can imagine that SSO becomes one critical part of the system design and user experience design for complex and distributed system, or for a new application to integrate with the existing connected system. With SSO enabled, a system owner can manage access control at a centralized place, therefore granting users permissions cross multiple subsystem is organized. On the other hand, as an end user, he/she only needs to secure one set of credentials to access multiple resources or to access functionalities whose distributed architecture is hidden from the user. No technology lock-in for authentication server, resource servers as well as client-side apps. Fortunately, we can leverage existing open standards and open source software to implement a SSO for a distributed system. First, we will rely on OAuth 2.0 Authorization Framework and JSON Web Token (JWT) open protocols. OAuth 2.0 is used to support common authentication workflows; in fact, the above 4 types of grants in the requirements are the terminologies borrowed from OAuth 2.0 protocol. JWT protocol is used to standardize the sharing of a successful authentication result cross clients apps and resources servers. The protocol allows resources server to trust a client request without double checking with authentication server, which lowers the amount of communication within a distributed system, therefore increases the performance of overall authentication and identification. For more technical details on how to use OAuth 2.0 and JWT for authentication, please see Stateless authentication with OAuth 2 and JWT - JavaZone 2015. Regarding to building the authentication sever, where all users and machines will sign-in, authenticate, authorize, or identify themselves, the critical requirement for the authentication server is that this server implements OAuth 2.0 protocol and use JWT as the bearer token. As long as the authentication server implements the protocols, the rest of facilitating features can be built on any technology. I like use simple_oauth module with Drupal 8, because out-of-box, this solution is the whole application, including users, consumers and tokens management. Particularly, I have been helping to optimize the user experience of user authorization process for different use cases. If you are not familiar with Drupal, a particular distribution Contenta CMS has pre-packaged simple_oauth and its dependencies for you. Once the authentication server is in place, we will implement the protocol and workflows on resource server and client-side apps. This part is largely up to your resource server and client-side technologies you picked. We are building this part of integration with Node.js, Laraval, Drupal 7 and Drupal 8 applications. As the time of writing, we have published the module oauth2_jwt_sso on Drupal 8. I leave the extensibility, limitation, and more technical details of this SSO solution for the upcoming DrupalCon Nashville session. I will include the session video here in late Apri, 2018. Fantastic post, roadmap on D7 and Node.js jwt modules? This is exactly what I've been looking for using ContentaCMS as the authentication broker for a swarm of D7 / node.js docker containers. I've been looking to replace Bakery with something more standards based and the roads keep leading here; Any roadmap / modules out there for the node or D7 editions of this module? module to D7, but I do not have an estimate yet. We also have an implementation in work for Node.js integration. Hopefully, we can publish them in the near future.